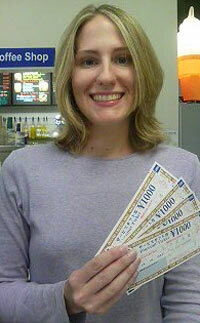 Jenni Jacob from Reynoldsburg, Ohio, won Y4,000 dinner tickets usable at any Sam’s by the Sea restaurant. She has been on Okinawa five years, and says her life here is wonderful. During her days off she likes to spend time with her family and volunteer for good causes. She also likes reading, and going to beaches and sightseeing. Alicia Doaez is from California but has lived on Okinawa nearly three years. She is the winner of \4,000 telephone cards courtesy of KDDI. On her free time she likes to watch movies. She is also an enthusiastic member of the Mexican folk dance group Ballet Folklorico. To participate, visit Japan Update website at www.japanupdate.com, click on “sign up to win” button and type your name, telephone number and address in the form provided on the website. The deadline of each week’s raffle is Monday at 2 p.m. and the raffle will be held soon afterwards. Those who miss the deadline will be entered in the following week’s raffle. We will contact the winners by telephone to arrange for them to pick up their prizes. The winners will also be announced in the same week’s Japan Update on Thursday.